DIY - Cardboard Boat Race fundraiser! competitors a fixed build time, using only a predetermined number of cardboard sheets, glue, adding machine tape, and paint. Duct tape is also often a key ingredient. 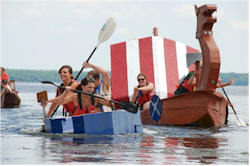 Once completed, teams must race their boats across a shallow pond or river, using similarly constructed oars. The boats will almost always flood, sink, or shred under the weight, mostly due to the difficulties of waterproofing cardboard. Awards are often given out for effort and spirit, instead of victory. Some offer two categories – Fast and Funny. Boats are inspected pre-race to determine if they are “fast” or “funny”. The funniest boat winner gets a prize regardless of speed or floatability! Life jackets are required for all participants.